Porcupines aren’t difficult to identify. Their sharp quills give them a distinctive appearance and serve a practical purpose by keeping predators away. While all porcupines share similar characteristics, you’ll find some differences based on the type of porcupine and its habitat. Differences are most pronounced between New World and Old World porcupines. Porcupines that live in Africa, southeast Asia and southern Europe are classified as Old World, while those who live in South, Central and North America are New World porcupines. Porcupines range in body length from 15 to 36 inches, and have tails that are 8 to 12 inches long, depending on the species. Porcupines live approximately 15 years in their natural habitats and up to 20 years in zoos. Female porcupines have litters that range in size from one to four baby porcupines. Quills are soft at birth, but harden soon after to protect the young porcupines from predators. As many as 30,000 quills cover every part of a porcupine’s body except its stomach. Quills have sharp, pointed ends that stick in the skin of any animal who decides to risk attacking a porcupine. The National Geographic website mentions that porcupines can’t shoot their quills as once thought, but notes that the quills will fall off a porcupine’s body if touched. Old World crested porcupines have the largest quills. Their quills can grow as large as 20 inches long on the crested area, which covers the head through the shoulder. Crested porcupines have shorter quills on their back and rump sections. New World porcupines have barbed quills approximately 4 inches in length. 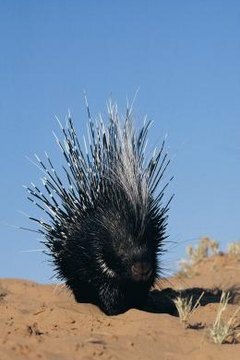 When either type of porcupine is threatened, its quills become erect, which makes the animal appear larger and more dangerous to predators. Porcupines live in a variety of habitats, including wooded areas, prairies, mountains, rain forests and deserts. New World porcupines make nests in logs, tree roots, holes in rocks and trees. They spend a substantial amount of time moving from tree to tree in search of food. Their long claws make it easy to grip tree bark when they climb. Old World porcupines prefer the ground to trees. The San Diego Zoo website notes that while these porcupines don’t jump or climb well, they are good swimmers. Old World porcupines live in holes, crevices, burrows or caves. Porcupines prefer to hunt at night and use their sense of smell to guide them to food. Porcupines are herbivores, or plant eaters, for the most part, although some might eat the occasional lizard. Sharp front teeth help these animals bite and chew plants. Old World porcupines eat berries, bark, roots and fruit, and invade farmers’ fields in search of pumpkins, potatoes and other crops. New World porcupines prefer a diet high in pine needles and bark, but also eat berries, fruits, leaves, roots, grass, flowers and tubers.